I've never been the best when it comes to foreign languages. When in secondary I was taught Latin, French and German but I only retained the most basic of words like hello and goodbye. To Be honest I never thought I'd really need to use it in day to day life. 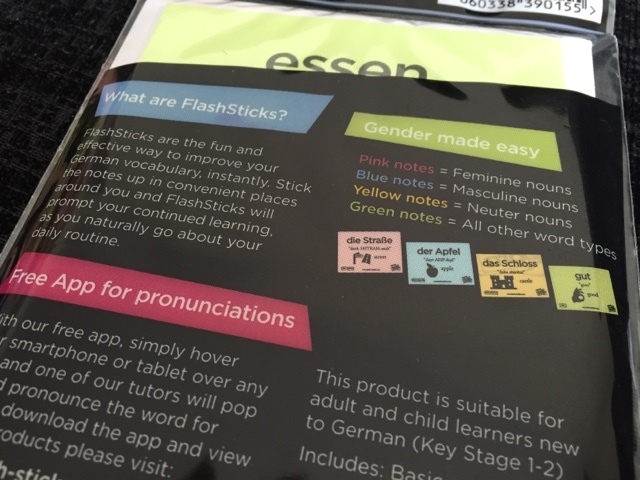 However my father in law happened to marry a German woman, now she can speak perfect English but her parents can't so when I was offered the opportunity to review Flashsticks I thought it couldn't have been better timed. Now if you've not heard of Flashsticks before let me explain a little. These are handy foreign language post it notes. Each one comes with a commonly used words with it's translation as well as an icon and how it is said phonetically. Each set of post it notes are colour coded to keep it simple. Blue for masculine nouns. pink for feminine nouns, yellow for normal nouns and green for all other words such as verbs. What makes these post it notes even more effective is the app that you can download to partner them. Working on both apple and android, you simply hover the app over your chosen post it note and a person will appear pronouncing the word for you. This is brilliant as people learn in different ways, some can take on board knowledge just by seeing but others find it easier hearing and doing. There are three levels available beginner, intermediate and advanced, making them suitable for all ages. For now I am using beginner and I'm hoping once I've got to grips with them that I can share with my children too. The post it notes are great size that you can pop them in your hand bag and learn whilst on the move. If you happen to have a long train journey for instance then you have these to help pass the time. 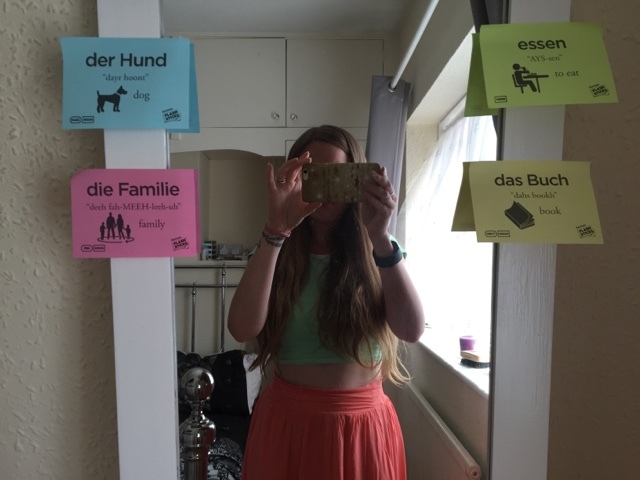 At the moment I've been sticking them around my mirror and learning whilst getting myself ready in the mornings, switching them up when I can remember the words. 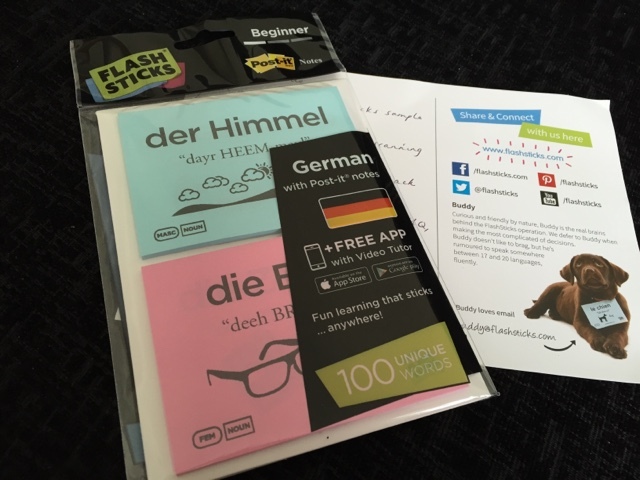 Each pack costs £4.99 and contains 100 words and the fact they can be looked at again and again makes them great value for money. I think what I'd like to see is perhaps examples of using the words in sentences so I can develop the ability to have a proper conversation not just being able to pick out certain words being said. Overall a great tool, simple yet fun and something that the whole family can use. 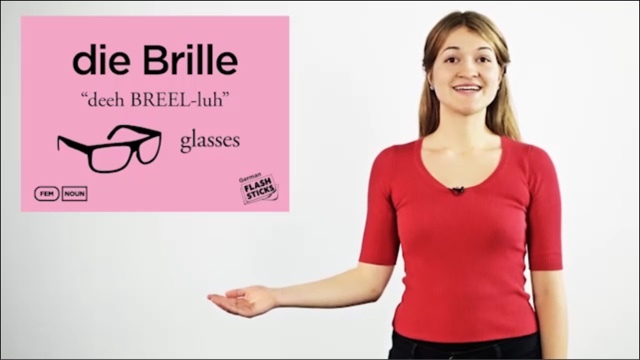 Other languages available are Spanish, Italian, Portuguese, French, Mandarin, English and British sign language (I'd love to try this one too). Definitely worth checking out. Disclaimer I was sent this product FOC however all thoughts and opinions are my own. 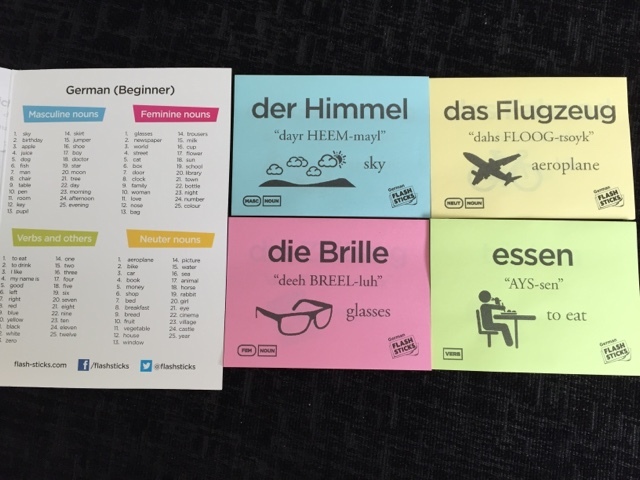 These look great, we are raising my daughter to be bilingual - her dad is Danish and I think things like this might help to make things fun and get my to try to use my Danish a bit more! Great idea.